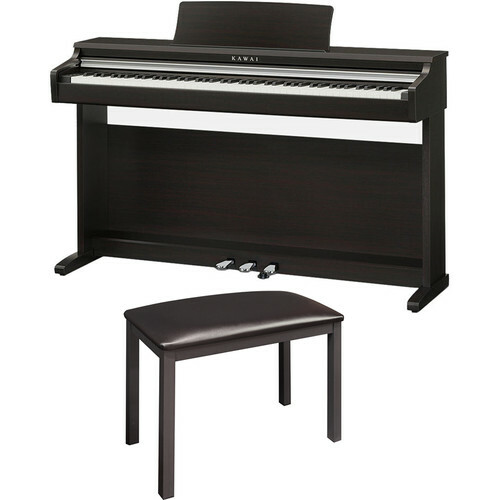 The rosewood KDP110 88-Key Digital Piano from Kawai is an addition to Kawai's digital piano lineup that features a sampled Shigeru Kawai SK-EX 88-key grand-piano sound, Responsive Hammer Compact II keyboard action, and convenient Bluetooth, USB, and MIDI connectivity in a compact cabinet design. The instrument is suitable for the home or studio and can be used by beginners, teachers, or professionals to deliver a realistic grand-piano touch, tone, and feel. Supplementing its realistic acoustic piano voices, the KDP110 also offers a selection of additional instrument sounds, including electric pianos, organs, harpsichord, vibraphone, and strings. The dual playing mode allows two different voices, such as an acoustic piano and a string ensemble, to be layered together for a more complex sound that inspires greater musical creativity. Built with a 40W stereo amplifier and two 4.7" speakers, the digital piano also features a song recorder, a sliding-type key cover, collapsible music rest, and is equipped with a selection of lesson songs by classical composers. In addition, Alfred's Basic Piano Library lesson books 1A and 1B are included. With its natural tone and wonderfully responsive touch, the KDP110 88-Key Digital Piano is fully equipped to get you playing, practicing, and composing immediately. The KDP110's Responsive Hammer Compact II (RHCII) keyboard action has been developed to represent the distinctive touch of an acoustic grand piano. Its springless technology and sturdy construction delivers consistent upward and downward motion for a smooth, natural, and highly authentic piano playing experience. The KDP110 digital piano captures the sound of Kawai's Shigeru concert grand piano. All 88 keys of this instrument are meticulously recorded, analyzed, and faithfully reproduced using advanced Harmonic Imaging technology. When playing a piano, the amount of pressure applied to the keyboard affects not only the volume of the sound produced, but also the unique tonal character of each note. Each key of the piano is recorded individually, but also at various volumes, ranging from gentle pianissimo to thunderous fortissimo. This ensures smooth tonal transitions across the keyboard and throughout the entire dynamic range of the instrument. A powerful digital effects engine further enhances the instrument's core sounds, applying additional reverberation effects that simulate the acoustic environment of a recital room, live stage, or concert hall, which brings performances to life. This results in a rich, vibrant piano tone that delivers added realism and authenticity. The KDP110 digital piano also includes a variety of convenient digital functions to complement its authentic keyboard touch and rich grand piano sounds. A selection of different instrument voices, built-in lesson songs, and the ability to record and playback one's performance are some of the features accessible from the discretely placed cheek-block control panel. Bluetooth and USB functionality allow the instrument to be connected to other devices as well. The instrument's convenient lesson function allows pianists to study classical piano using a collection of Czerny, Burgmüller, and Beyer etudes, or learn time-honored standards from the popular Alfred Basic Piano course books. The left and right hand parts of each etude or song can be practiced separately, with built-in metronome and adjustable tempo controls that help to improve timing and rhythm. The KDP110 also offers a selection of additional instrument sounds, including electric pianos, organs, harpsichord, vibraphone, and strings. The Dual playing mode allows two different voices, such as an acoustic piano and a string ensemble, to be played together for a more complex sound that inspires even greater musical creativity. The digital piano features a three-song recorder, allowing performances to be recorded to internal memory and played back at the touch of a button. This technology enhances the depth and realism of the instrument's sound when listening through headphones or earphones. There are three different acoustic presets that adjust the spatial positioning of the sound. This reduces auditory fatigue when listening with earphones or headphones for extended periods of time. In addition, users can select between a variety of headphone types for an optimized listening experience. Featuring a USB-MIDI port and standard MIDI in/out jacks, the KDP110 allows you to connect to a computer for notating compositions, or to other MIDI devices like synthesizers and workstations. The KDP110 digital piano is equipped with integrated Bluetooth MIDI technology. This allows the digital piano to communicate with supported smart devices wirelessly. Once paired with a phone, tablet, or laptop, you can expand the instrument's functionality with a wide range of education, performance, and scoring apps. Box Dimensions (LxWxH) 58.5 x 22.25 x 21.5"
KDP110 88-Key Digital Piano (Rosewood) is rated 3.0 out of 5 by 2. Rated 5 out of 5 by RQ2018 from Great piano Painless purchase process with B&H. Received piano on 3 days. Piano is beautiful and the sound is great. Rated 1 out of 5 by Raaj from Rebound noise and poor support from Kawai There is a clear rebound noise in this piano when we release the keys. I noticed this only after the return window when the piano teacher pointed this out to us. I have been trying to get help from Kawai since a few months but my voice mails and emails have not been returned. It says 3 years warranty but I really doubt Kawai is standing behind their warranty. This has been a huge dissappointment.